Welcome to the new website of the Swiss Journal of Educational Research (SJER)! You can now directly upload the papers you wish to submit to expertise for a potential publication in the SJER. Moreover, since January 2019, we ensure open access to all the articles that we publish (and have already published) on our website. The SJER is a publication medium for researchers working in the field of educational sciences. It contributes to the development of educational sciences by promoting the exchange of research results and strengthening the relationships between university-based and non-university-based institutions. Through its selection of topics it reacts to the multifaceted requirements of the discipline and contributes to academic and public topical debates. The multilingual nature of the journal provides readers with an overview of the main trends of research in the various language regions of Switzerland and other countries. A scientific advisory council of international composition guarantees the quality of the journal. 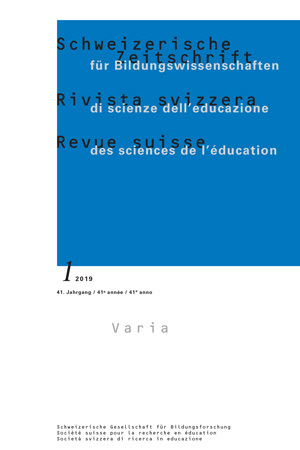 The Swiss Journal of Educational Research is a publication of the Swiss Society for Research in Education (SSRE/SGBF) supported by the Swiss Academy of Humanities and Social Sciences (SAHS). Peer to peer mediation at school: search for a program for a primary school in Valais. A systematic review based on the «Evidence-Based Practice» criteria. Do school principals in multicultural and disadvantaged schools face specific challenges? Amongst the Resources Mobilised By The Student To Plan His Traineeship, What Role Does He Foresee for His Institutional Trainer?